SKU: CS 11. Quantity:45 0 grams. 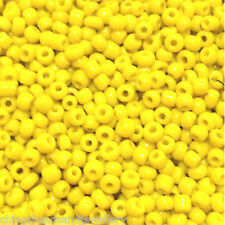 50g Yellow Silver-lined - 2mm glass hex / 2-cut beads. Colour : Yellow. You will receive the beads in a grip seal bag, which can be resealed and reused. Length : approx 3mm. Hole size : approx 1mm. 11/0 Seed Beads - Various Themed Mixes, Ideal starter packs! Lemon Jade is usually yellow-green in colour but it can also vary with white, grey, brown tones. Most Lemon Jade is veiny or slightly spotted and when polished has a silky lustre. It is typically translucent to opaque and rarely semi-transparent. High quality Japanese seed beads from Toho. Suitable for jobs which need a regular sized seed bead. Round holed. Toho Code: 147. Colour/Finish: Ceylon Pearl Barley. Size 11 beads are 2.2 mm in size. 2mm round glass seed beads that have a smooth surface and a striking finish. Use these beautiful seed beads to decorate your clothes, scarves, pillowcases and handbags. Each 2mm bead has a 1mm hole. High quality Japanese seed beads from Toho. Suitable for jobs which need a regular sized seed bead. Round holed. Toho Code: 402. Colour/Finish: Opaque Citrine Yellow AB. Size 11 beads are 2.2 mm in size. Size: 2mm - ss6. These are high quality and shiny resin rhinestone gems. The smaller sizes of resin rhinestones (2mm - 3mm) have 10 to 12 facets and the bigger sizes have 14 Facets (4mm - 8mm). Resin rhinestones differ from acrylic rhinestones as acrylic rhinestones only have 8 facets. High quality Japanese seed beads from Toho. Suitable for jobs which need a regular sized seed bead. Round holed. Colour/Finish: Ceylon Custard Yellow. Toho Code: 902. Size 11 beads are 2.2 mm in size. Colour/Finish: Ceylon Banoffee Yellow. High quality Japanese seed beads from Toho. Suitable for jobs which need a regular sized seed bead. Round holed. Toho Code: 903. Size 11 beads are 2.2 mm in size. 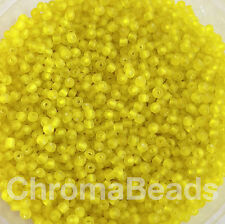 40grams of 2mm YELLOW SEED BEAD MIX. GREAT MIX LOVELY COLOURS. GREAT FOR JEWELERY MAKING. Galvanised Yellow Gold 91053. Miyuki Seed Beads 8/0. Canary Yellow Picasso 94512. Miyuki Seed Beads 8/0.